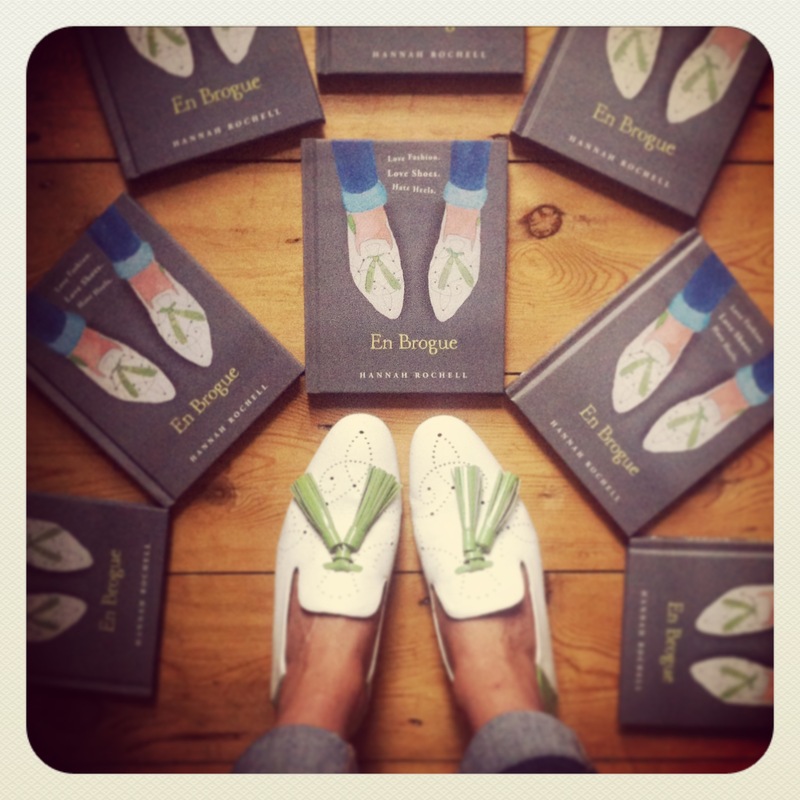 En Brogue is a blog that focuses on style AND comfort, written by me: fashion writer Hannah Rochell. You’ll find nothing on here but stylish flat shoes and inspiration on how to wear them, along with a few of my illustrations to boot. I am a fashion journalist with ten years experience in the industry, working at titles such as The Evening Standard, The Times and InStyle. I NEVER wears heels, mainly because I find them terribly uncomfortable, but also because I have a bad back and am a bit of a tomboy (many of my style icons are men!). I don’t think that wearing flats has any impact on whether or not you look stylish, so long as you choose the right shoes. My books En Brogue: Love Fashion. Love Shoes. Hate Heels and The Trainers Guide are available now from Waterstones, Amazon and all good book stores. En Brogue has been featured on BBC Radio 4, ITV’s This Morning, and in The Daily Telegraph, The Evening Standard, The Times, Grazia, InStyle, Red Magazine, Marie Claire, Stylist, Look, Elle, The Guardian and The Observer. The watercolour illustrations in my books are also painted by me. En Brogue is a registered trademark. Disclaimer: All content that appears on En Brogue uses brands and products I genuinely like and photographs taken by me unless credited otherwise. Occasionally I will be gifted a product for review but I will only write about it if I love the product and it fits with the En Brogue mantra of style AND comfort. Sometimes En Brogue uses affiliate links which means if you click on a link from an affiliate site site, I might make commission from your purchase. All affiliate links are individually marked [AD]. Any paid for posts or promoted giveaways are always clearly marked as such. I don’t have this particular style so hard for me to comment, but all the styles I do have are indeed very comfortable. I think some of the more “formal” styles (so the ones that don’t have a rubber sole) do take a bit more time to wear in but I’m sure they will! Top tip: try warming them up with a hairdryer, then wear them around the house with thick socks. This should soften the leather and speed up the road to comfort! Hi, Hannah. I just finished reading your book. It’s great fun — lots of info and sweet illustrations. One question for you: have you ever tried Tieks ballet flats? If so, what do you think of them? Thanks very much! Ah thanks – glad you like the book! I haven’t tried them but I will have a look. Thanks! If the link doesn’t work, enter the item no: 291512145291 into the ebay search bar. Although the sale ends today, I’ll probably relist any remainign items very soon, so keep a lookout. Thanks! or enter item no: 291539880135 in the ebay search bar. Love love love your Instagram feed! Wondered if you knew of any companies that do shoes that can be worn with orthotics (or have removable insoles as standard). I’ve just started wearing orthotics and have spent HOURS looking for things but to no avail 😦 any advice would be mega! A late reply to this comment I’m aftraid. Ecco and Geox are two brands that sell shoes with removable insoles that can be replaced with your orthotics. If you wear insoles for over pronation Birkenstocks have inbuilt support and are brilliant for the summer. Hi Hannah! I just discovered your blog and love it! Thank you! I wonder if you could write ab bit about your style icons and what you like about how they dressed (yes, the male icons as well as the female!). Hi Jude! Thanks so much for the kind words. I’d love to write this! They’re basically all male. Leave it with me – I’m away at Paris fashion week at the mo but when I get back I’m on it!! Yes I’m trying to do more of that – just cutting my face out where possible – I hate having my picture taken! There’s a bit more on my Instagram account @enbrogue as I have to do it over fashion week for work. Thanks for your support!! So very good that ‘no heels’ is gaining momentum. Good work, Hannah! The difficulty I have is finding fashionable footwear in wide fittings, especially when dressed up. I need comfort (don’t we all?) as live in London and walk wherever I can so don’t always want to wear trainers / carry shoes with me, and refuse any more to be hobbled! Am seriously fed up seeing most magazine styling dependent on towering heels and being over 5’9! Have you tried Ted & Muffy? Really lovely shoes with width fitting options. I would like to personally congratulate you as your blog En Brogue has been selected by our panelist as one of the Top 75 Shoe Blogs on the web. I personally give you a high-five and want to thank you for your contribution to this world. This is the most comprehensive list of Top 75 Shoe Blogs on the internet and I’m honored to have you as part of this! Yesterday i saw a japanese woman wearing the most lovely shoes.the company is called sou sou.the shoes are hand made and they ship abroad.worth a look. I’m in desperate need of help with brands that do fancy flats suitable for a winter wedding. I’ve not got the dress yet but it’s likely to be short and patterned or brightly coloured. But happy to also be wearing colourful shoes – want to steer clear of black.I love Rogue Matilda but don’t want to wear lace ups. I’d love something in velvet but not essential! Thanks! Hello! I’m going to a wedding next month and will be wearing the white version of these with a bright dress. They’re super comfy and very very flattering on the leg. Doesn’t look like they do white anymore but this blue is rather nice. That’s great thanks! I would never have thought of looking at Mango for shoes! Me neither – Alex from The Frugality had a similar pair last year so I snapped these up when I saw them this year! Honestly, they are some of the most flattering flats I’ve ever worn. Hope you like them!